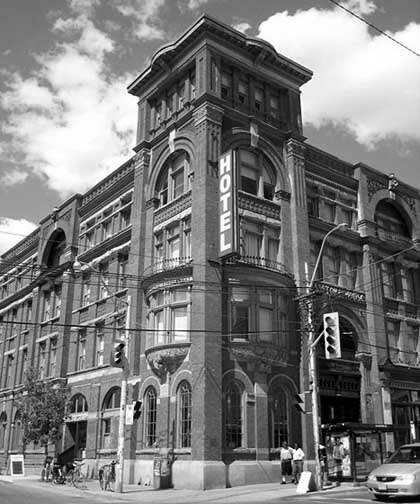 Built in 1889 the Gladstone Hotel is Toronto's oldest continually operating hotel. The hotel was named after Gladstone Avenue, which in turn was named after British prime minister William Ewart Gladstone, and served as a last stop for travellers coming through the old Parkdale Train Station to rest, and to purchase liquor before heading off to Hamilton. It is located just east of Dufferin on Queen Street West, which was the far western edge of the city during the Gladstone's heyday. Since its very beginning the Gladstone Hotel has been a family run business. The original owner Susanna Robinson lived in the hotel and operated it with the help of her 13 children. It is currently owned by the Zeidler family who completed a historic restoration of the property taking it out of what same may consider somewhat questionable circumstances to a very trendy, upscale, arts and culture based hotel. Errol Bruce Knapp had mentioned the Gladstone Hotel as a place of interest to the us. So when we heard from local mentalist Chris Mysterion who has performed there we were intrigued. According to Mysterion "the Gladstone is rumoured to be haunted by a piano playing ghost, along with some other apparitions who have been seen over the years roaming through the halls." The latter may have subsided now that renovations are complete. He also states "I did a "seance" there once and an odd photo came out of it- of course I am a person of science, however the pic is odd and shows what appears to be a form coming from the table." Please note Mysterion's seances are for entertainment performances only, and the audience is made aware of that fact from the beginning of the show. Who knows.... if he may have just accidently conjured something up at the historic venue.